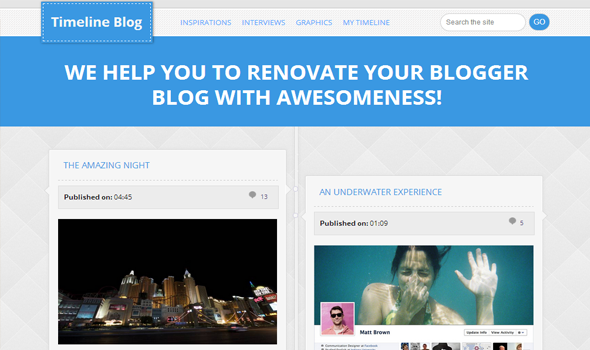 Timeline Magazine is the first blogger template inspired from Facebook Timeline. In this theme, posts are displayed in a horizontal order in two columns. It has overwhelming appearance, which would magnetize a lot of visitors to your blog. By default, this template comes with Whitish blue color scheme. However, you can change its color scheme accordingly. This theme is ideal for those websites which are based entertainment, news bulletin, Gadgets and technology. The uniqueness of this theme would make your users to rethink about your website. Timeline Style: Your Posts would be displayed in according to the publish dates. The appearance of your posts would be much like Facebook Timeline because it is somewhat inspired from it. The design it fully unique and could make your website absolutely adorable. SEO-Friendly: Like our prior themes, we tried to make them SEO-Friendly so that users can make most of their articles. It is already optimized for on-page SEO, so there is no need to do things manually. Related Posts: This theme has a built-in related post plugin which would display most relevant suggests to your visitors. It would not only decrease the bounce rate of your site but would increase your website credibility. Portfolio and Personal Blog: This template can also be used on a Portfolio site as well as on Personal Blog. We have included two different templates in the package so users of all departments can make use of it. We hope this theme would help you in giving a new shape to your website. We have tired our level best to keep this theme fast and responsive. We have tested in Chrome, Firefox and Internet explorer. We have added almost all gadgets, so there is no need to do lots of editing. If you liked this template, then do share it with your friends. One question syed, Which is template play better role in SEO? Think to change, is this Template is better than apollo? All Themes here @Template are SEO Friendly. None is Better nor Weaker. You can use anyone that you like. nice theme syed, keep it up ! for this template, there is error when I applied to my blog at blogspot.com. We tested it again and it works just fine. What is the difference between the two styles? I will not find the difference between the two styles. I want to explain the difference between the two styles.